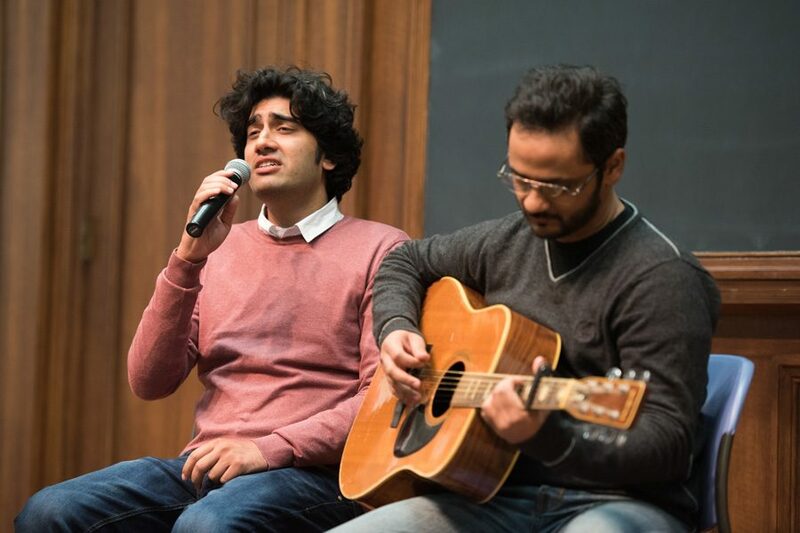 Pakistani pop stars Ali Aftab Saeed, left, and Saad Sultan, right, sing in an impromptu music concert Monday night. The artists arrived at Northwestern this week to begin a two-week residency as Jean Gimbel Lane Distinguished artists. In seemingly innocuous music videos, a group of Pakistani pop stars don colorful face paint, elaborate costumes and silly expressions. But behind the guise lie biting lyrics that critique top brass military officials, advocate for religious minorities and fight for gender equality. This is the Beygairat Brigade, a band that revolutionized Pakistani pop culture in 2011 when it released “Aalu Anday,” which translates to Potatoes and Eggs, a satirical song sung in Punjabi that exposed social justice issues. Musicians Ali Aftab Saeed, 30, and Saad Sultan, 29, who are both part of the Brigade, arrived at Northwestern this week to begin a two-week residency as Jean Gimbel Lane Distinguished artists, a program sponsored by the Buffett Institute’s Global Humanities Initiative and the Alice Kaplan Institute for the Humanities. While at NU, the two musicians will perform in a concert alongside Anubhav, a student Hindi film dance team, and Brown Sugar, a South Asian student a cappella group, this Tuesday night in Lutkin Hall. History Prof. Rajeev Kinra, who planned the artists’ residency with Asian languages and cultures Prof. Laura Brueck launched the Global Humanities Initiative in Fall 2015 following a call from the Buffett Institute for faculty ideas after it received a donation of more than $100 million from Roberta Buffett Elliott (Weinberg ‘54) earlier that year. Kinra said he hoped their new initiative would bring both classical and modern artists from around the world into the Western conversation. “Because of the political nature of a lot of their work — using satire, using humor to bring a focus to what’s happening with religious minorities in Pakistan, they’ve become in many ways the symbol of a certain generational shift in terms of political protest and social media,” Kinra said. When they play — Sultan on the guitar, Saeed as vocals — they communicate silently through a combination of subtle nods, gestures and facial expressions. As the two perform, Sultan alters his timing, volume and sound to complement Saeed’s impromptu vocal riff. But the two musicians differ when it comes to personal style. Saeed said the Brigade, with its provocative lyrics, relies on satire to convey its message. Sultan, who has a career independent of the Brigade as well, prefers to use more conventional music to impart his opinions. Nevertheless, the two have collaborated on three additional satirical songs since their rise to fame in 2011 and have received overwhelmingly positive feedback, Saeed said. One of the songs in particular, however, offended some people. “Dhinak Dhinak,” released in 2013, satirized the power of Pakistan’s high-ranking military generals, their manipulation of the news media and proxy wars. Saeed said the video disappeared after being uploaded to the Internet. He added that it resurfaced a year later after people re-uploaded it to different websites. Since then, the pop stars have worked together on more serious, less satirical music and videos while still addressing social justice issues. In 2015, they released “Gao Suno Badlo,” a six-song album highlighting controversial issues in Pakistan, like women’s empowerment, minorities’ rights and equal access to education. Next week, along with their live concert, the two artists will record a new song in the School of Communication’s “sound space,” a recording studio that opened last month. The studio, which includes a foley pit for creating realistic ambient sounds, high-end recording equipment and sound-proof paneling, was built last year using money from an anonymous donor, Communication Prof. Jacob Smith said. For their next professional endeavor, Saeed said the musicians will record a song about Pakistan’s largest city, Karachi. The song, titled “Someone is Up,” sounds almost like a lullaby romanticizing the city’s sleepless nature. Saeed added that as artists, they will continue to stretch boundaries.